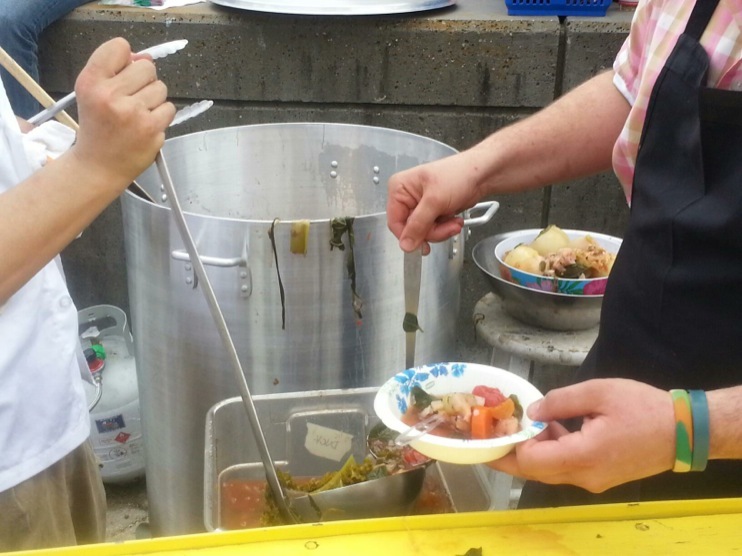 Dana Milbank: The motto for this protest — soup’s on! The motto for this protest — soup’s on! 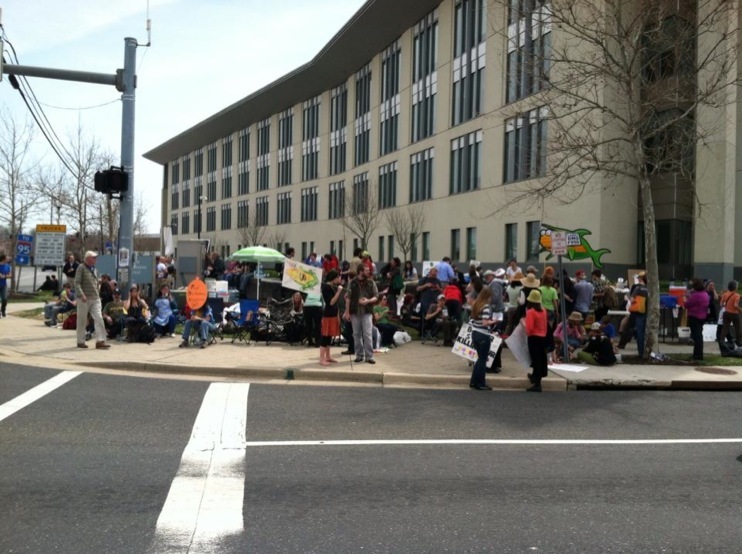 When authorities got wind of a demonstration planned for Monday outside the Food and Drug Administration’s offices in College Park, they fortified their defenses. A motorcycle and nine police vans, ominously marked “Homeland Security,” parked in front of the FDA building, and uniformed officers fanned out across the entrance, where they waited. They needn’t have. 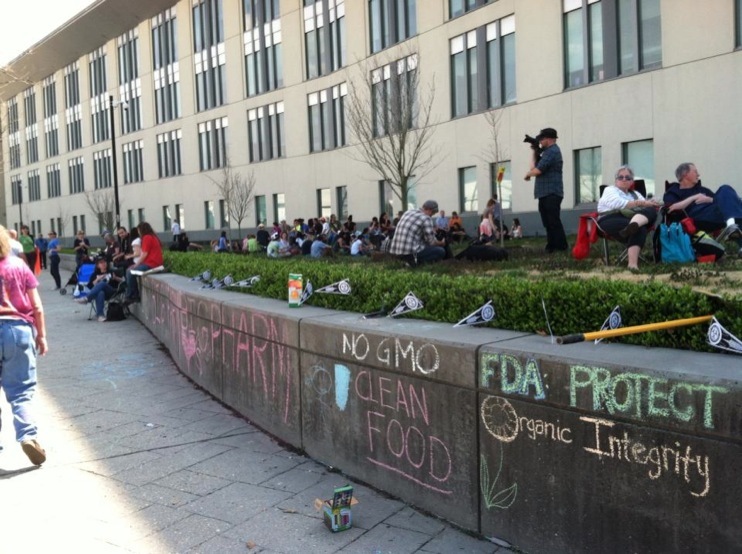 The demonstrators, demanding that the FDA require the labeling of genetically modified foods, hadn’t come with violence in mind, or even civil disobedience. They had come to cook a 50-gallon vat of soup on the sidewalk and then consume the stuff — a first-ever “eat-in” at the FDA, they said. She reached into her handbag. “Want some sunscreen?” she asked. This is the face of the new protest movement — or at least organizers hope to make it so. Taking a page from the gay-rights playbook, other causes on the left are holding fewer of the disruptive protests of recent decades and opting for persuasion over confrontation. In part, this strategy reflects the failure of recent movements, such as Occupy Wall Street and the anti-globalization demonstrations, to turn protesters’ enthusiasm into enduring public support. The campaign against GMOs is typical: The movement has dropped its demand that such altered foods be banned, instead embracing the more reasonable goal of labeling such foods accurately. 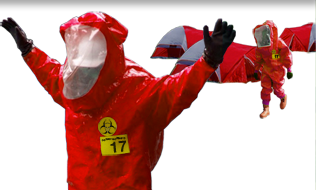 And activists are looking for non-threatening ways to broaden the cause’s appeal. Llewellyn based Monday’s event on “Stone Soup,” a European folk tale about a traveler who persuades villagers to contribute to a communal meal. 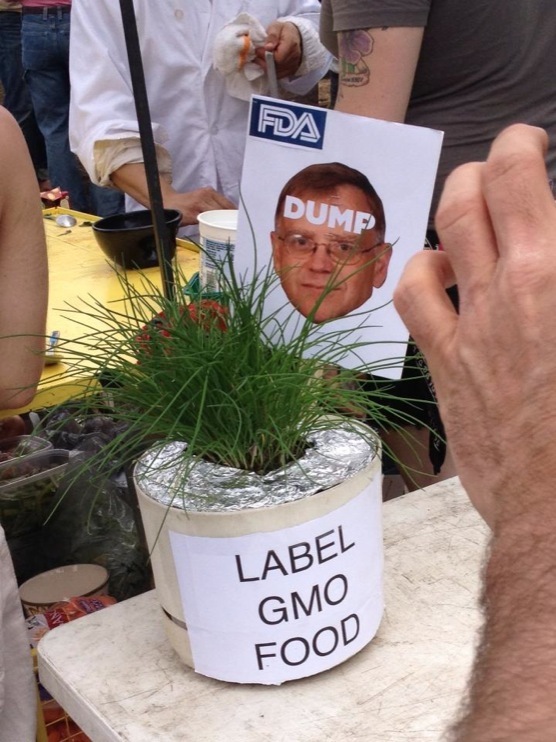 He borrowed the idea from peace activists of decades past, but made his a GMO-free soup. “I’ve come here with this magical soup stone,” he told the crowd of 60, which swelled through the morning as the soup boiled. Peter, a 12-year-old from Pennsylvania, announced: “I came here today with just organic mushrooms.” His mom patted him on the back after his turn at the microphone. A woman from Atlanta, Jay, was one of several to call for the resignation of Michael Taylor, the deputy FDA commissioner who had worked at Monsanto, a major GMO producer. “I’m a mother of an 8-year-old child and she’s not a science experiment,” the woman said. This article was syndicated in the Salt Lake City Tribune, The Oregonian, The Herald, The Orland Sentinel, West Hawaii Today, St. Louis Post-Dispatch, Shreveport Times, Delmarva Now, The Herald Tribune, AZ Central, and Faribault Daily News. Prince George’s Community Television: Food activists converge on the FDA for an Eat-In protest of GMO foods. Fast forward to 4:45 to watch the segment on the Eat-In at the FDA. Looking for more labels on the food we eat, Monday morning dozens gathered outside the Food and Drug Administration Center for Food Safety. Kathy Engle-Dulac says genetically modified foods, or GMO’s, raise the biggest concerns. 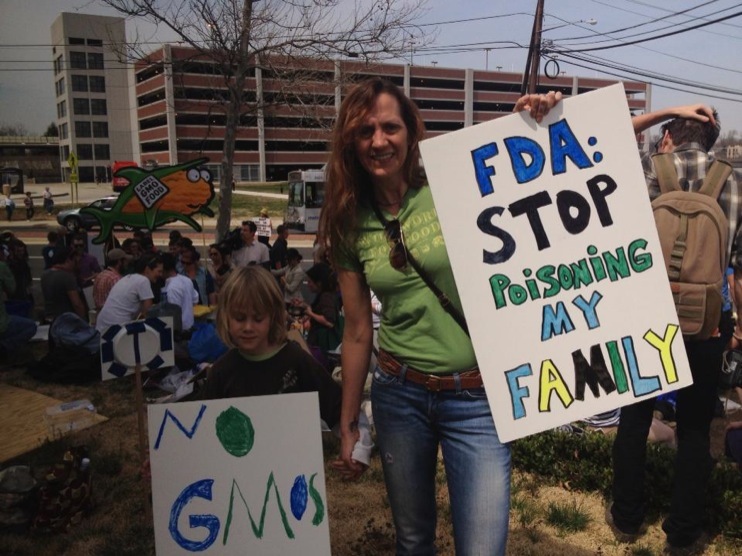 If a food product has been genetically engineered, she believes consumers have the right to know. Like others gathered Monday, she’s asking the FDA to change their policies so when consumers walk into a grocery store they know what they’re buying. Organic farmer Martin Dagoberto says he’s not sure if they’re as safe. He’s worried if there’s more GMO’s, it could affect his farming process. “It’s basically jeopardizing the organic integrity of our food supply of our seeds and its making organic farming almost impossible,” Dagoberto says. 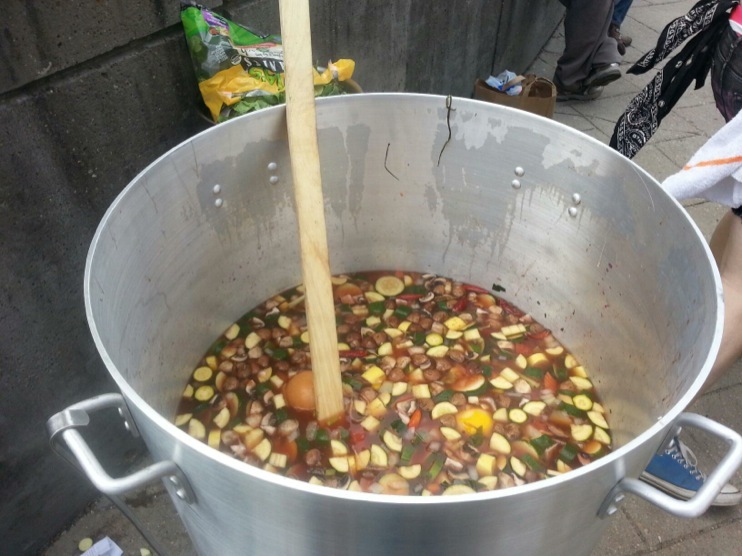 We write to you with the invitation to come join us for some delicious Stone Soup that we will prepare on Monday, April 8, outside the Center for Food Safety and Applied Nutrition in College Park, Maryland. At 1pm we would like you to address our concerns about the labeling of genetically engineered foods sold in the United States of America. We will bring a small public address system and will provide you with an opportunity to speak to those gathered about why the FDA refuses to change its outdated policies concerning the labeling of genetically modified (“GMO”) foods. We promise to be respectful. We are genuinely hungry for answers to our concerns. As you very well know, your administration purports man-made, patented genetic technology in our food does not constitute a “material difference” to require a byline on a food label. This is a grossly benighted position that has evoked an eruption of public protest and media investigation for over a decade. This position leads us to ask: whom does the FDA aspire to protect? 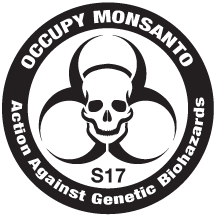 You owe the American people an explanation for why U.S. policy on GMO labeling keeps us ignorant of whether our food has been genetically modified, while citizens in other countries around the world are granted the right to make informed decisions based on accurate food labels. Americans from all over the country will bring ingredients to make the Stone Soup on the public sidewalk outside the Center for Food Safety and Applied Nutrition between 8:00 a.m. and 12:00 p.m.. Before they add their ingredient(s) to the pot, they will have the opportunity to address you and your staff members in order to express why they want genetically engineered foods to be properly labeled in America. The soup will be 100% vegan and we will compile a thorough ingredient list to show how easy it is to make an honest food label. We expect some may come to speak about the pending disapproval of the genetically engineered Aquabounty Salmon and we hope staff members will consider listening to these oral comments, as well as accept hand-deliveries for docket FDA-2011-N-0899. As a novel drug that is bypassing the normal clinical research phases that drugs overseen by your administration normally require, there needs to be much more dialog with the American public in order to provide absolute proof that the food adulterants used to produce synthetic meat for human consumption are safe enough to not require mandatory GMO labels. While we have asked everyone to bring their own bowls and spoons so that our picnic will not generate unnecessary waste, we will bring you and Michael Taylor your own bowls & spoons because we genuinely desire your presence. Our upcoming picnic has a purpose that we hope you and your staff members will fully acknowledge and embrace, which is Americans want the FDA to require GMO labeling. Moreover, we hope your staff members feel empowered to engage in a friendly dialog with us over a bowl of delicious Stone Soup. By offering you organic food, we are not trying to bribe you or your administration in any way. Rather, we wish to speak with you through the act of sharing of a communal meal. Our sharing of food is symbolic of our peaceful demonstration of free speech, and thus an expression of one of the myriad fundamental freedoms we cherish as citizens. We hope you feel welcomed by our invitation, and that this letter inspires you and your staff to join us in the spirit of camaraderie between fellow eaters. We are unaware of any official reply that was generated from your administration. Before we arrive on Monday, April 8, to prepare the Stone Soup, we would love a response posted on the FDA website because, frankly, we are really hungry for some answers. See you on the sidewalk.